GILGIT: After a gap of 42 years, a two-day traditional festival marking the start of wheat sowing was held in Altit area of Hunza district. The two-day event, starting from Saturday, was organised by the local community with the assistance of Hunza Art and Culture Council and Altit rural support organisation. The Bafao festival was historically celebrated to mark the start of spring season in the area. In Brusheski language Bafao means wheat sowing. According to the local people, before 1964, this festival was celebrated in Hunza when the weather in the valley became warmer suiting the wheat cultivation. The festival used to be arranged under the auspices of Hunza state head in the month of February. The local people said the Hunza ruling family used to stay in Altit fort for few days to celebrate the event. The state rule system ended in Gilgit-Baltistan in 1974, so were the other traditions and rituals, including the Bofao festival. 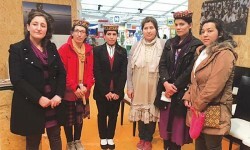 The festival was held at Chataq, near Altit fort, attended by a large number of women and men, representatives of local administration and other government officials, foreign and local tourists. Local artists presented traditional music, while notables of the area and young people danced wearing traditional dresses. Local singers also presented poems praying for good wheat harvest. “The event is meant to show our happiness over arrival of spring season after the prolonged winter,” Hunza art and culture council president Sardar Khan said, adding the festival was revived after decades. He said other festivals like Tukhamraziin in upper Hunza and Nuroze would also be celebrated in the current season to make the young generation aware of their history, and to promote unique traditions internationally and attracting foreign tourists. Gilgit-Baltistan Governor Mir Gazanfar Ali Khan, who is also former Hunza state ruler, attended the programme as the chief guest. He was received at Chataq by elders at the beat of local music. Speaking on the occasion, Gazanfar Ali said he was happy that the tradition of celebrating Bofao festival had been revived. He said his family had been arranging the event in Hunza for decades. The governor announced that the Bofao festival would be celebrated officially from next year. He also inaugurated the tree plantation campaign by planting a sapling.